The war film has long been a staple of cinema, from 1930’s ALL QUIET ON THE WESTERN FRONT to 1998’s SAVING PRIVATE RYAN. Almost every major war in human history has been depicted in some form onscreen, yet the genre persists because the high-charged, ideological nature of warfare makes for compelling drama and action. While most mainstream works in the genre are romantic glorifications of combat, the most potent stories have taken a distinct anti-war tack, arguing against warfare as a means to solve conflict. The trend began in earnest during the widespread disillusionment that the Vietnam War engendered and gave us the likes of such classics as THE DEER HUNTER (1978), but one of the strongest anti-war films in cinematic history had already been made almost two decades prior by a rising wunderkind director named Stanley Kubrick. 1956’s THE KILLING put Kubrick on the radar of Hollywood movers and shakers. Kubrick and his producing partner, James B. Harris, needed to capitalize on their momentum and get another project into development, and in short order they acted on Kubrick’s desire to make another war film after the self-perceived failure of his last go at the genre (1953’s FEAR AND DESIRE). 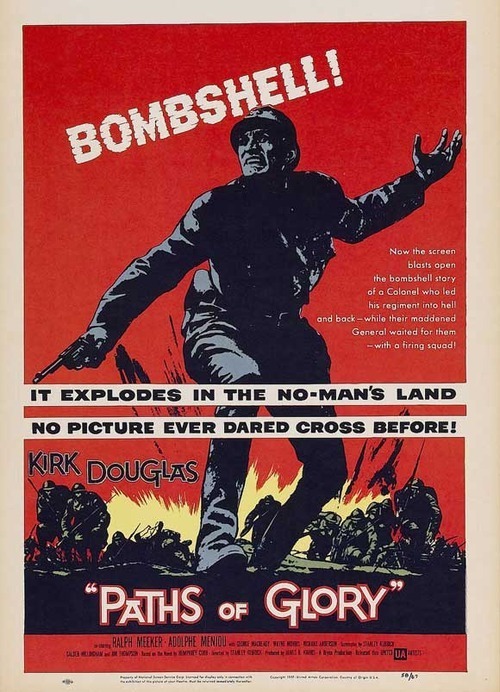 He remembered a book he had read when he was fourteen, Humphrey Cobb’s seminal World War 1 novel “Paths Of Glory”, and subsequently enlisted Harris to license the film rights. The resulting screenplay, written by Kubrick, Calder Willingham, and THE KILLING’s Jim Thompson, aroused the fervent interest of Hollywood superstar Kirk Douglas, whose participation afforded the filmmakers a budget of one million dollars. While it was the biggest budget Kubrick had worked with to date, it still wasn’t a huge amount of money (even by 1957 standards) with which to make a sweeping war film. Nevertheless, Kubrick and company found themselves in Germany shooting PATHS OF GLORY, a feature that performed modestly at the box office but would come to be heralded as an “important film” and solidify Kubrick’s reputation as a major new voice in the art form. PATHS OF GLORY takes place in France during World War I. The two warring factions—France and Germany—have dug themselves into sprawling networks of trenches while enduring an agonizingly long stalemate. A decorated French general, Paul Mireau (George Macready) is tasked by his superior general Broulard (Aldophe Menjou) to break the stalemate and organize a charge through No Man’s land to take The Anthill—a small, heavily fortified enemy encampment. The land gain is only a few acres at best, but Mireau agrees that it is a worthy endeavor. He selects a promising young colonel named Dax (Kirk Douglas) to plan the offensive. Despite his initial misgivings about the mission’s futility and the likelihood of a staggering casualty rate, Dax accepts the assignment and leads his men up and over the top of the trenches towards certain death. The charge fails spectacularly, the men falling back like a tidal wave—that is, if they even got out of the trench in the first place. In a bid to save himself from massive embarrassment, General Mireau orders the execution of three men from Dax’s battalion by firing squad for the crime of cowardice. Dax volunteers to defend these men—who were chosen by lottery—at the mandatory court martial, but he soon realizes that the trial is more akin to a kangaroo court, and these men’s death warrants were signed long before their names were ever chosen. As the prisoners languish in prison and await the final verdict, Dax races against the clock to exonerate them and deliver justice. When the story draws to a close, PATHS OF GLORY reveals itself as a hard-hitting examination into wartime ethics and the moral conundrums that arise when there is too much investment in an ideological struggle. Kubrick’s cast for PATHS OF GLORY represents an impressive collection of cinematic heavyweights delivering career-best performances. Douglas takes every opportunity to chew scenery as the idealistic and virtuous Colonel Dax. Principled and heroic, his former criminal defense lawyer is sharp as a tack and doesn’t let any injustice get past him without condemning it. His working relationship with Kubrick, while paying dividends for both men’s careers, was reportedly contentious at best. They challenged each other in a way that only two men who truly shared a mutual respect could. Unlike a great deal of directors, Kubrick rarely worked with the same actors over multiple films, and when he did it was only during the first half of his career. Yes, he collaborated with Sterling Hayden, Timothy Carey, Joe Turkel and Peter Sellers more than once, but their second efforts with the director were in supporting roles. Only Douglas has the distinction of headlining more than one Kubrick film, which speaks volumes as to the nature of their stormy, yet fruitful working relationship. Menjou and Macready form something of a two-faced antagonist, with Macready being the cold, pragmatic yin to Menjoy’s warm, grandfatherly yang. Macready’s performance as the scarred, ruthlessly vindictive General Mireau is particularly notable for its’ dark, Kubrick-ian irony—that of a man who will dress himself up in the colors of honor and patriotism to justify his twisted agenda. Kubrick’s supporting cast is well-assembled, with Ralph Meeker gaining the most screen time as Corporal Philippe Paris, a disgruntled idealist chosen for the firing squad. His uncompromising masculinity reminds me of a proto- Josh Brolin, and his is easily one of the most memorable performances in the film. As the second doomed man—Private Pierre Arnaud— Joe Turkel brings an unconventional physicality to the role, one which would help him greatly when Kubrick called on him to play the ghostly bartender in 1980’s THE SHINING. THE KILLING’s Timothy Carey plays the third man—Private Ferol—a self-described “social undesirable”. Something of an overgrown man-child, Ferol regresses to a simpering, childlike state when faced with the immediate prospect of death. Carey’s second performance for Kubrick would also be his last—his increasingly difficult behavior and bad habit of scene stealing and unpredictable performances led to Kubrick souring on him. A run-in with the law during the shoot was the last straw for Kubrick and Harris, and they subsequently fired him before he had shot all of his scenes, requiring the use of a body double to finish his performance. Finally, there’s Christiane Harlan, who plays the small role of the captive German girl singing a packed beer house of French soldiers during the film’s closing sequence. Her unsteady yet ethereal performance is captivating simply because she is the first female presence that we encounter in the film, and the story literally stops in its tracks to lose itself in her beauty. This part of the film might’ve been no more than a footnote in Kubrick’s filmography had it not been for the fact that he ended up falling in love with this woman, and would divorce his wife, Ruth Sobotka, a year later in order to marry her instead. This time, the marriage would stick, with Christiane and Stanley remaining together until his death in 1999. Kubrick’s filmography is littered with unforgettable images, but PATHS OF GLORY is the first instance in his canon where the cinematography is truly gorgeous. Shot by cinematographer George Krause, the black and white 35mm film image is artfully composed to fill the 1.66:1 widescreen frame. The film’s camera movement is notable in that it is where Kubrick’s signature aesthetic truly coalesces and emerges. His use of the dolly, for instance, is compelling and purposeful, often letting such moves go on for a long time in order to establish scope and mood. One instance is the Anthill charge, which unfolds almost entirely in one lateral-moving dolly that tracks parallel to the action. Another moment takes place shortly beforehand, with Douglas marching down the long trenches in an unbroken shot while a flank of soldiers look on and explosions rock the ground above him. This shot in particular also shows off Kubrick’s affinity for one-point perspective compositions, employed as a way to lure the audience deeper into his meticulously-crafted world. Furthermore, Kubrick makes subtle use of zoom lenses during the charge sequence, which introduces an element of documentary to the proceedings while linking Kubrick to the directors of the New Hollywood school—a generation of filmmakers who made frequent use of zoom lenses in a bid to inject reality and immediacy into their work while rejecting the polished techniques of their Golden Age forebears. In his fourth feature, Kubrick focuses quite acutely on music and its effect on storytelling, acting with a conviction and sense of purpose that was missing from his previous work. More than five decades removed from the film’s release, we know that Kubrick would become well known for his excellent ear for classical music and its placement in his work. More often than not, such moments have become some of cinema’s most enduring combinations of sound and image. Later works would increasingly do without an original score entirely, with Kubrick himself publicly stating that nothing new could compare to the masterworks of the great classical composers, so why use anything else? PATHS OF GLORY marks the earliest instance of this aspect of Kubrick’s aesthetic, with Kubrick opening the film with a rendition of the French national anthem, “Marseillaise”. He then goes on to include a small number of other classical cues, like Johann Strauss’ “Kunsterleben Op. 316” during an Officer’s Ball sequence. This image in particular—aristocratic men and women waltzing to classical music in large, opulent spaces—would itself become a recurring motif throughout Kubrick’s career. For the most part, however,PATHS OF GLORY relies on Gerald Fried’s original score. Having scored all of Kubrick’s films up to this point, Fried drastically departs from his usual swelling, orchestral sound for the film. Instead, he opts for a minimalistic and militaristic snare drum/trumpet combo that keeps the energy up and the tension roiling. PATHS OF GLORY ruminates quite heavily on the nature of war and violence, a topic that held Kubrick’s interest his entire life. The film looks at violence as an agent of discipline, as well as how conflict rooted in ideology causes us to dehumanize the opposition as “the other” and justify actions that would seem outright barbaric in the cold light of day (like sending three innocent men to their deaths so that a high-ranking officer can keep his reputation untarnished). Interestingly enough,PATHS OF GLORY is the rare instance in Kubrick’s filmography where the perspective sides with the moral and virtuous character—in other words, the traditional “hero”. His later works would examine similar ideas about dehumanization and madness, but from the perspective of the afflicted, ultimately giving into the darkness within. PATHS OF GLORY also sees the beginning of Kubrick’s on-screen fascination with baroque architecture, most notably in the choice of location for the French army’s chateau headquarters— eagle-eyed viewers might recognize the chateau location as the same one used for Alain Resnais’ fundamentally haunting LAST YEAR AT MARIENBAD (1961) . Kubrick often frames his subjects in a wide shot during these scenes, allowing the ornate, gilded interiors and echoing marble halls to overwhelm them with insignificance (while also providing an ironic visual counterpoint to the officers’ admittedly barbaric, uncivilized judgment of three innocent men). Kubrick also contrasts the spacious, royal nature of the chateau—home to the well-fed and well-dressed elite of the French leadership—with the gritty, mud-soaked trenches in which the rank and file grunts carry out their orders. The soldier vs. officer/pawn vs king metaphor at play here is quite deliberate—Kubrick’s love of chess profoundly influences his sense of dramaturgy. PATHS OF GLORY is the first of Kubrick’s films to use baroque imagery to convey salient points about class conflict, but it wouldn’t be last—from 2001: A SPACE ODYSSEY (1968), to BARRY LYNDON (1975), all the way to EYES WIDE SHUT (1999), Kubrick’s filmography is dominated by this distinct architectural style and the cultural attitudes it engenders. PATHS OF GLORY marks a huge step up in Kubrick’s development as an artist and a filmmaker. In terms of scale alone, Kubrick proves himself to be the real deal. The complex staging of the central charge sequence shows that Kubrick could handle a grand epic just as well as an intimate heist thriller—indeed his next movie gig came about precisely because he proved he could handle a large scale. While it performed as expected at the box office (read: not well), PATHS OF GLORYnonetheless holds up today as one of the best war films ever made—an assertion backed up by the Library of Congress when it was added to the National Film Registry in 1992. PATHS OF GLORY is currently available on high definition Blu Ray via The Criterion Collection.